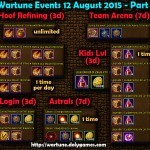 Hey everyone, in this article I share the Wartune Events for the 12th of October 2018 (article + video)(New Event Cycle). Event Chest & Event Mini-Item Exchanges – 9 days: various item exchanges (similar to previous ones). 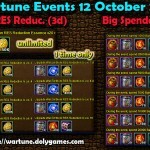 Includes 999 Tennis Hat event mini item exchange and Dragonchant Potency items (although expensive). 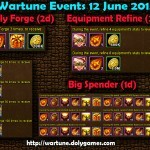 Interesting items remain: Symbiosis Stones and Clothing Refinement Stones. Special Mount Hot Exchange / Lucky Exchange based on the Apple special event item. 200 Event Chest Exchange – 4 days: They had cancelled this one and now it is back again. Various items available. I would not recommend to do any of these trades unless absolutely needed. (was expecting this event but did not show up when i checked) Train Holy Sword – 7 days: During this event use X Polishing Orbs to obtain rewards (Gold, Event Item and Orbs in return). Event was setup from 100 to 1000 Orb usage per day. Hi, thanks for your comment, but I have to disagree with proof. My posts are accurate which can be confirmed with the video I have also provided at the bottom of every article where the event dates and configurations can be seen. What I think may be causing a confusion is perhaps you are playing on a different Wartune platform which is following different schedules. So if in doubt can always check the video. There have been several times lately where what you posted did not match. I’m on Kong, and we generally have what R2 says we should have. We just had holy sword week before last. AFAIK, all R2 based west coast servers run off the same DB, same with all R2 east coast, oriental, european, etc. We were never different before, how do you explain? Hi, I really cannot explain differences between platforms such as Kong / R2, etc, as I do not work for any Wartune company. I just report what I see and I provide the videos also so that anyone can check the videos if there is any doubt. As for mistakes like Yellow Peach when it should have been Apple they tend to fix those mistakes some time after. 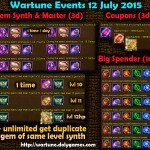 In general they do not do a good quality job and they don’t even understand Wartune very well. Again sorry I am not in the position to explain why Wartune companies do different things for different platforms or do a bad job with events. I just do my best to help people by reporting what I see or analyze. Save your apples and dont exchange till the devs fix the fact that the ‘Royal Steed’ card mount cannot be recycled.